To me this design looks like a quilt laying on a couch. Thus the name, quilted fabric. I love that every time you quilt this design the outcome will always be different. Start by quilting or marking two curvy lines that cross each other (pink lines.) From there you will echo your original lines on both sides. Remember that gentle curves work best with a walking foot. I drew my lines very quickly and free form. You can see that my spacing is off a little bit because I just eye-balled it. However I think it works for this design. It’s pretty busy so it won’t matter if you aren’t echoing your lines perfectly. 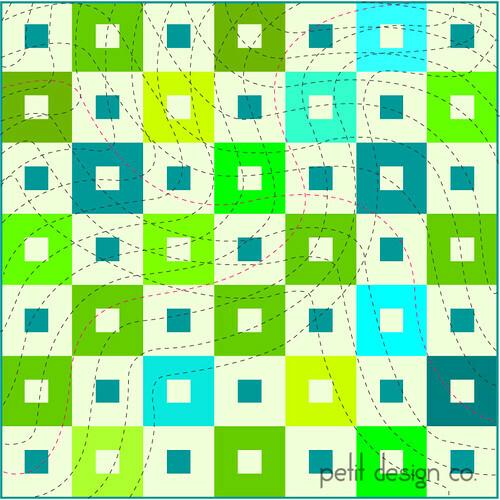 This design will add plenty of texture to your quilt but is more interesting than a plain grid. I'm new to your blog, visiting from Karen's "Find a Friend Friday Party! You are obviously a much more experienced quilter than I am, but I'm learning and keep doing them. I'm now a follower, hoping to learn a few tricks! I love this! Thanks for the whole series! I am getting many, many new ideas! I found you from Nostalgic Cafe.